Someone Bought This: The WWF... on LASERDISC! - WrestleCrap - The Very Worst of Pro Wrestling! 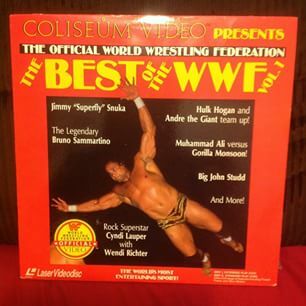 Someone Bought This: The WWF… on LASERDISC! The WWF released four titles on laserdisc! For you younger readers, Laserdiscs were like really big DVDs that held half a movie on each side. 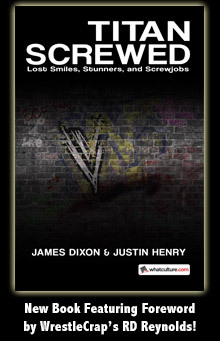 No Holds Barred, Wrestling’s Bloopers Bleeps And Bodyslams, The Best Of Hulk Hogan, and The Best Of WWF Volume 1. As far as I know, these were the only laserdiscs WWE ever released. Screw Blu-Ray! Give me laserdiscs any day of the week! Someone Bought This: Hulk Hogan in space? 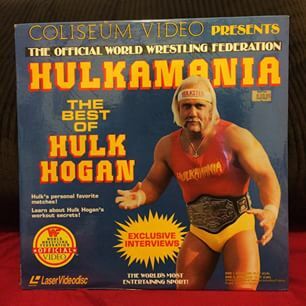 8 Responses to "Someone Bought This: The WWF… on LASERDISC!" 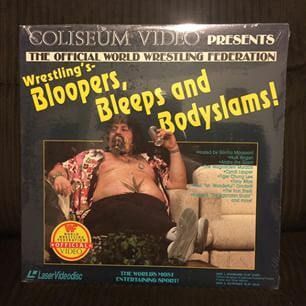 Bloopers, Bleeps, and Bodyslams: because somebody wanted to see Hillbilly Jim’s crotch in glorious Laserdisc. 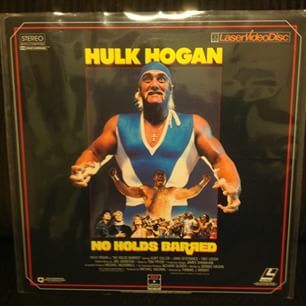 No Holds Barred on Laserdisc? Hope it is not made out of dookie. And what a glorious picture of Capt. Lou Albano that would be to display on any movie collector’s shelf. It will slide into the spot next to Amadeus and The Godfather on the prestige side of the mantle. Maybe it’s because the picture’s so small … but it looks like Albano shaved the hair on his belly into the shape of a marijuana leaf. Hulk Hogan? I know those words…but together they don’t make sense…what’s a Hulk Hogan? I feel like Lisa from the Bart vs Australia episode when she saw Yahoo Serious on a marquee. Now there’s a name I haven’t heard in years! Wasn’t there a period in the early 90s or something when Nickelodeon was trying to push him? The way I read that I assumed bloopers bleeps and bodyslams was the title for Hogan’s best of..
Wrestlemania 1 was also released on Laserdisc.